Online listings are the first step of almost every real estate sale these days so it is crucial that yours be in great shape. Attracting buyers with property listings can be a challenge for many real estate agents, but if you keep the right things in mind, it is easy to use them effectively. One of the biggest mistakes I see in real estate listings is lack of personality. These listings are there to grab people’s attention and get them interested in buying your property. It is hard to do that with bland messaging. Make your listings unique by adding your own voice and perspective on the property’s features. If you think the backyard is great for pool parties or that the location is in a cozy neighborhood, put that in the listing. Anything you can add that helps readers picture themselves in the property is a good thing. This is, in my opinion, the single biggest factor in persuading homebuyers to call about a property. You can have great copy and a great property, but if you do not have good photography, homebuyers will hesitate to schedule a showing. First and foremost, when it comes to real estate photography, hire a professional. The job of an online listing is to show off the beauty and selling points of a property. The last thing you want is a smartphone picture sullying your listing. Interior shots are a must, but it is usually the classic exterior “front door” shot that draws buyers in, so make sure to get that one right. 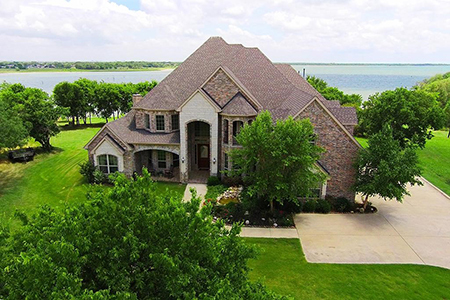 Good exterior photographs will include as many of the property’s selling points as possible, and there is no better way to get a shot like that than with an aerial perspective from a drone. Hiring a drone is easy, and you can even save money by finding drone photographers who also take interior shots. After your stunning photographs bring people to your listing, use well-written copy to convince them to schedule a showing. The best-written articles seem to find the perfect balance between detailed and focused. They include more information where it matters but are concise enough to keep the listing from overwhelming the reader with information. Try to put yourself in the shoes of someone who would buy your property and imagine what would be most important to you. If you are selling a multi-million dollar home, emphasize the name-brand appliances and updated hardwood flooring. If you are selling a mid-range home, talk about the new fence and comfortable neighborhood. Use descriptive words where appropriate, but try not to overdo them. Last, but not least, please do not be cheesy. There are way too many agents out there using all-caps and writing headlines that sound more like clickbait than a real estate listing. It is not necessary to resort to such tactics. If you keep your listings clean and simple, and make the best details easy for readers to find, your listings will be much more effective. This post was originally published on RISMedia’s blog, Housecall. Blog.rismedia.com. Check the blog daily for top real estate tips and trends.